【ADVANTAGE】Cooling while absorbing sweat without dripping water or wetting your clothes. Cooling through the evaporation of moisture, which is eco-friendly and reusable for long lasting value. 【MULTIPURPOSE】Slim design, wicks moisture for enhanced comfort. It is featured by high absorption of the water, non-stick to the body, anti-bacteria and mite-proof, sweat-absorbent, breath-freely, quick dry and also provides UPF 50 sunscreen protection. Suitable for indoor exercise, outdoor activities and hot weather. Can be used for wiping perspiration in sport, reducing fever, treating burns and scalds and Etc. 【NICE PORTABLE POUCH】Nice portable and waterproof carrying pouch with carabiner clips is an unique design for you to to carry the towel and makes it convenient to attach to your belt of sports bag, camping hammock and traveling backpack on a rock climbing, golf trip, marathon and other outdoor activities. 【COMFORTABLE FIT AND FASHION】Soft, lightweight, non-slip fabric and a decent size (120cm x 30cm) to be a towel, scarf, headband and bandana around your neck or head. It's attractive to use in public. The edges are smoothly finished and the exquisite stitching prevents the 4 semicircular corners from unraveling. 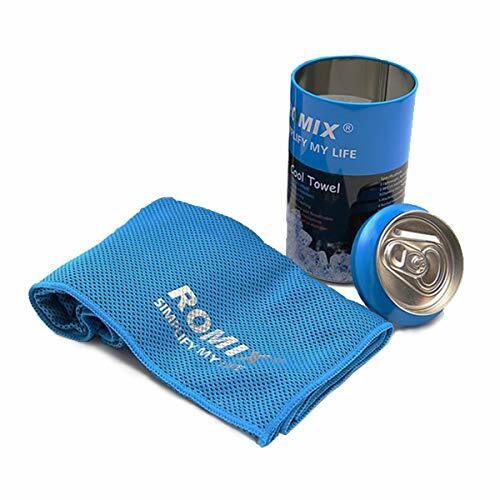 If you have any questions about this product by Romix, contact us by completing and submitting the form below. If you are looking for a specif part number, please include it with your message.